Medicare has been touting the merits of the “competitive” bidding program for durable, or home medical equipment and services (HME) to convince Congress that the program is good for seniors. Unfortunately, proponents have conveyed misleading information and cherry-picked facts that exaggerate the benefits and ignore the shortcomings of the program. MYTH #1: The bidding program is good for beneficiaries because it will significantly reduce cost-sharing requirements. REALITY: Patient copayments for home medical equipment have fallen dramatically for many years along with decreasing home medical equipment reimbursement rates. A bipartisan bill in the House, H.R. 3790, would eliminate the bidding program in a fiscally responsible manner by reducing home medical reimbursements to offset savings that the bid program would have realized. So the effect of that bill, which has 179 cosponsors so far, would be a further reduction in copayments for Medicare patients. Moreover, most beneficiaries have Medigap policies that cover copayments, so insurance companies will be the primary beneficiary of the lower copayments. More importantly, low copayments come at a great cost in terms of reduced access and service. The bidding program will trigger a race to the bottom in terms of care for seniors and people with disabilities. The bid program will ultimately increase doctor visits, hospital stays, and nursing home admissions, which in turn will increase copayments and other costs for patients and for Medicare. 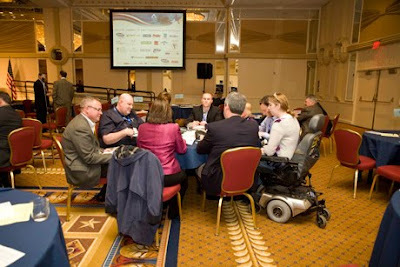 Organizations that support the elimination of Medicare’s competitive bidding program for durable medical equipment include the ALS Association, the American Association for Respiratory Care, the American Association of People with Disabilities, International Ventilator Users Network, the Muscular Dystrophy Association, National Emphysema/COPD Association, National Spinal Cord Injury Association, and Post-Polio Health International. MYTH #2: The bidding program will eliminate fraud in the durable medical equipment sector. REALITY: To characterize the bidding program as an anti-fraud mechanism is extremely misleading. The real solution to keeping criminals out of Medicare is better screening, real-time claims audits, and better enforcement mechanisms for Medicare. The American Association for Homecare has proposed an aggressive 13-point plan to combat fraud (www.aahomecare.org/stopfraud) and many of those provisions are included in two bills in Congress. The Association endorses Sen. George LeMieux’s anti-fraud legislation, The Prevent Health Care Fraud Act of 2009 (S. 2128), and its companion bill in the House, H.R. 4222. Also two new requirements that took effect in October 2009 – accreditation and surety bonds for home medical equipment providers – will go far toward eliminating fraud. MYTH #3: The bidding program is good for business because it creates a more competitive environment. REALITY: The program requires “suicide bidding” that coerces providers to bid at unsustainable Medicare reimbursement rates. At a time when the government is working to create jobs, the bidding pogrom is a job killer. In the first round of the program in 2008, 90 percent of qualified providers were barred from serving Medicare beneficiaries for the bid-upon items, even if they had agreed to the lower Medicare rates. MYTH #4: Providers will be competing on quality and price. REALITY: The “competitive” bidding program will, in fact, ration care. Home medical equipment providers already compete on the basis of quality in order to help in the hospital discharge process, which moves patients into cost-effective, post-acute care at home. The way this bidding program is set up triggers a race to the bottom in terms of quality and because losing the bid means going out of business, providers must engage in suicide bidding that coerces them to bid at economically unsustainable rates. This will increase Medicare spending in hospitals and ER visits. MYTH #5: The bidding program will make healthcare more cost-effective. REALITY: The home is already the most cost-effective setting for post-acute care. As more people receive good equipment and services at home, we will spend less on longer hospital says, emergency room visits, and nursing home admissions. Home medical equipment is an important part of the solution to the nation’s healthcare funding crisis. Home medical equipment represents less than two percent of Medicare spending. So while this bidding program may further reduce reimbursement rates for home medical equipment, ultimately, it will increase Medicare and Medicaid spending for hospitals, physicians, nursing homes, and emergency treatments. Several members of Congress spoke at the AAHomecare Washington Legislative Conference, March 1-3. All spoke about the benefits and cost-effectiveness of homecare and its importance in our healthcare system. 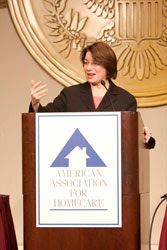 “Homecare is a major part of the solution in terms of cost-effectiveness,” said Senator Amy Klobuchar (D-Minn.) during AAHomecare Washington Legislative Conference. And with explosive growth in our older population, “homecare is going to be vital,” she said. Sen. Klobuchar has also been instrumental in reducing the size of the proposed tax on medical devices, which was included in the Senate’s health reform proposal. Congressman Heath Shuler (D-N.C.) spoke about his own grandfather’s requirement for oxygen after suffering a stroke. Shuler said, “His quality of life escalated unbelievably.” Shuler has been a steady champion for HME concerns, focusing especially on small-business implications. He was introduced at the conference by Heath Sutton, owner of Mountaineer Oxygen Services in Waynesville, N.C., whom Shuler credits with helping him to better understand the services required for Medicare beneficiaries who receive home medical equipment. Similarly, Congressman Altmire recommended that HME providers remind lawmakers that HME is cost-effective, high-quality, and is preferred by patients. Altmire said his awareness about HME issues is due largely to the tireless efforts of Georgie Blackburn, of BLACKBURN’S, an HME provider in Western Pennsylvania. 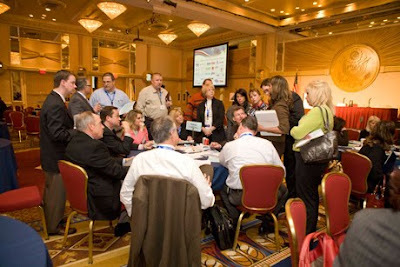 Thank you to everyone who attended the 2010 Washington Legislative Conference! We had over 270 attendees who charged Capitol Hill to fight for homecare. 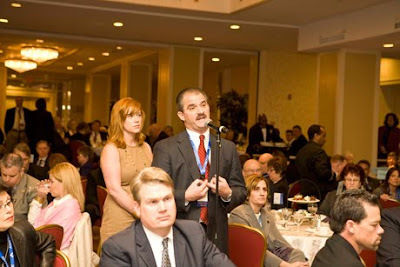 Director of CMS’ Center for Medicare Management, Jonathan Blum, receives tough questions from the luncheon audience. 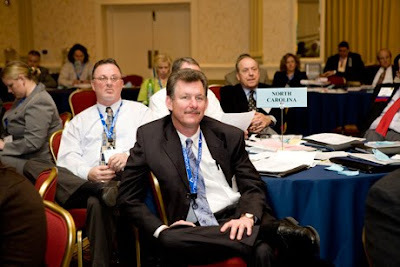 The North Carolina delegation listens in on a conference presentation. The New England Medical Equipment Providers (NEMED) group discusses issue strategy before heading to Capitol Hill. The North Carolina delegation discusses issue strategy before heading to Capitol Hill. 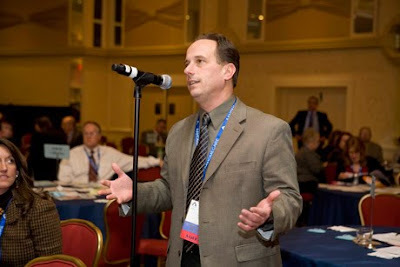 Joe Petrolla, of Seeley Medical, asks questions during a WLC session. Find and click the link on the right that says "AAHC Washington Legislative Conference"
Enter your email address and press 'Enter'.